2.Avail the facility without any request or visit to the Branch and be update with Account Info at any time wherever you are. 3.Share details like account no, branch name, IFSC code etc through SMS/email to receive remittance to your account. 4.Refer the bank to your friend via SMS/email. 1.Please install the application in the Android device. 2.On installation, enter the mobile number registered for SMS alerts. 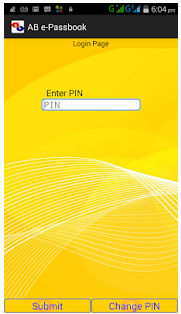 3.The entered registered mobile number will receive an OTP. With this OTP create a PIN and start using the application. Mobile network need to be enabled for using the AB e-Passbook.